Seth Taylor, Tyler Curtiss and Joshua Shaffer, who were all 18 years old at the time, were arrested at school for the crime. Matthew Lipp, who was also 18 at the time, was arrested at his home. 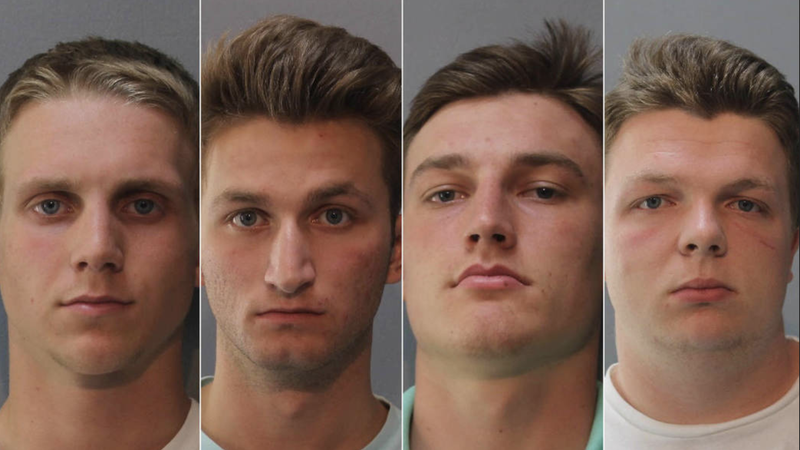 The four were charged with multiple counts of destruction of property based on race, color, religious belief, sexual orientation or national origin. Shaffer and Taylor pleaded guilty to the crimes, and in December, Shaffer was sentenced to spend 18 weekends in a detention center while Taylor was sentenced to 9 weekends, according to the Associated Press. They were both given additional penalties including supervised probation. Curtiss and Lipp pleaded not guilty to the crimes, but according to the Baltimore Sun, both agreed to the statement of facts presented by prosecutors. Their request to dismiss the hate crime charges was denied by a judge, and on Thursday afternoon, they received their sentences. Curtiss will spend his 19th birthday in jail this Friday. He was sentenced to eight consecutive weekends in jail. Lipp, who has already turned 19, was sentenced to 16 consecutive weekends in jail. Their weekends will start at 6 p.m. on Fridays, and they will be released at 6 p.m. on Sunday. Both teens were also sentenced to 250 hours of community service that they are required to have completed one year from April 1, three years of supervised probation to begin April 8, and they will be required to submit to any drug and alcohol testing, and to abstain from alcohol, illegal substances and the abuse of prescription drugs. According to the Sun, Curtiss has already completed 150 hours of community service, and Lipp has completed 60 hours. Brian Thompson, Lipp’s attorney, told the Sun he intended to file an appeal with the state Court of Appeals by close of business Thursday. “This was not just a simple prank … this was something that was 50 separate acts of hate, you have anti-Semitic graffiti, you have racist graffiti, racist graffiti that targeted Principal Burton by name, you have homophobic references that were made. This is an act of violence that rips the fabric of our community,” State’s Attorney Rich Gibson said. Can’t help but wonder how these sentences would look if the perpetrators were black.